15mm.co.uk: Prang have left 15mm.co.uk for a new universe! As announced back in October on the 15mm.co.uk blog HERE the Prang leave us on 9th November for pastures new. Pastures new and exotic with a big build up to a glorious 15mm scale future with The Ion Age our little sister brand that focuses on a unique space opera setting. Eli Arndt sculptor and creator of the Prang will join the team at The Ion Age appearing during December 2015. But from today the Prang are no longer SHM codes and no longer on our website. There was a last minute rush over the last week to get the current codes and all those orders are in the mail as of the start of this week. Do not worry you will only be without Prang for a month and their prices will remain at the same levels as before. Here are the codes that have ceased with us as of today. All of these miniatures will appear in the 'IAF' code structure in new packs along with several new poses before the real expansion of the Prang begins in earnest in 2016. If you still wish to get Prang in the meantime using the old codes then you can by email just contact us on sales@15mm.co.uk and ask for what you want. The SHM Range is HERE. If you are curious please visit The Ion Age to see what goes on there. We suggest you bookmark that blog or join its mailing list to be informed as to the reappearance and expansion of this hugely successful alien race. The greatest success story of the SHM Range that helps aspiring designers get their ideas into a white metal and resin reality. At the top of this short article is an image that shows two of the new poses arriving in December over at The Ion Age. 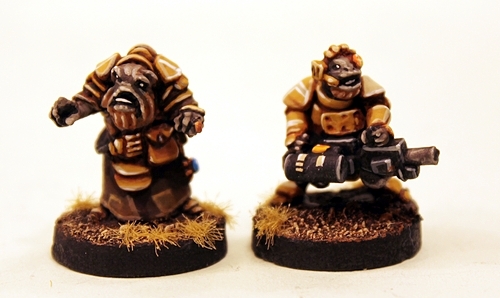 They are a Prang Sherag (advisor) and a Prang with a new heavy support weapon. There are a total of six new poses which when added to the existing eight means a kicking off start of fourteen poses of these aliens.